1. The meat should be marinated at least overnight, but it will actually develop more flavor, if you marinated it for 3 days. Begin by fist zesting the lemons (I use a micro plane), then juicing them. I use the tool pictured when I'm doing a bunch of citrus, It's SO much easier, then trying to squeeze each half by hand, and you get no seeds. 2. Peel, then grate the garlic into the bowl. 3. Add the rest of the ingredients, and mix it up well with a whisk. The mustard will help the oil to mix, and hold with the rest of the ingredients. 4. Trim any extra fat or grizzle from the meat, then tenderize it by poking it all over, and both sides, with a fork. Place the meat in a plastic bag, pour the marinade in, and set in the refrigerator until you're ready to cook. 5. To cook, place 2 pats of butter, and 1 tablespoon of oil in a Teflon pan, and cook over medium heat. Due to the thickness of the meat, it will burn, and be raw inside if you cook it on high. If the piece of meat is thin, you can use a higher pan temperature. Cook until the Internal temperature is 110 degrees for rare. Place on a platter and cover with aluminum foil. The temperature will rise another 7 - 10 degrees. 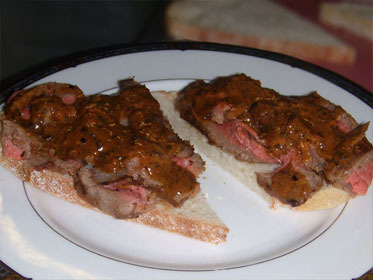 6.While the meat is resting, make the sauce, buy ladling about 1/2 cup of the marinade into the same Teflon pan you cooked the steak in, and reduce the marinade until it's fairly dry. Add the cream, stir to incorporate, and continue to cook until the sauce is a fairly thick consistency. Turn the heat off, and add the butter. 7. Slice the meat across the grain into real thin slices. 8. Place on the bread, then top with the sauce.